My father, besides being a biology professor, excellent skier and runner (sometimes he's even faster than me! ), is a master storyteller. Growing up, all of our longer outdoor excursions were driven by the promise for more stories. "Tell me about Nepal again! Tell the story about the keas in New Zealand!" I thought it was about time to share some of the magic with you. So without further ado, I present Dad's story of the first time he hiked the John Muir Trail - and his expectations for this time around. I just did it. I had no plan, little prior knowledge of the route, no food drops, minimal equipment, and very little money. On June 9, 1981, I shouldered my dilapidated pack and headed out from the Happy Isles trailhead in Yosemite Valley, intending only to see how far I could go, one day at time. Fifteen days later, after more than 220 miles (350 km) and 85,000 vertical feet (26,000 m) of ups and downs, I landed at Whitney Portal, at the other end John Muir Trail. I had just turned 27, and had been back in the United States less than six months after my Big Adventure, more than two years working, traveling, and hiking in New Zealand, Australia, and Nepal. I guess I was still a little restless. And lonely, too. On the far side of the globe I had spent some time with a self-entitled “rangerette” who had grown up in Yosemite National Park and worked as backcountry ranger there. Possibly the girl of my dreams. So after odd jobbing on the east coast just long enough to save up some travel funds, I flew out to San Francisco and made my way to Yosemite. I was welcomed and had a lovely few days touring around the Valley with my friend, but also learned the lesson that you can never just pick up where you left off. So maybe I had the walkin’ blues. That first night I slept out in the open on top of Half Dome. You could do that in those days, and it was a good way to stay out of trouble with the bears – on my previous visit in 1973 I had all my food taken by the legendary bears of Little Yosemite Valley, who had only gotten more devious in the intervening years. There were maybe 40 other people up there that night, including a group of graduating high school seniors from Berkeley that had hauled up two good-sized telescopes. I set off from Yosemite with only a local map and no real plan. When I blew through Tuolumne Meadows a few days later I picked up a JMT guidebook along with several days more food, allowing as to how I might possibly want to do the through hike, but because I had no food drops I knew I would have to take it one stage at a time. It was as minimal as I have ever traveled. I had a 10x12 foot tarp rather than a tent, but slept in the open on all but one night, in a worn-out synthetic fill sleeping bag on a thin, blue, closed-cell foam pad. I had no stove, a single, heavily fire-blacked pot for cooking and an empty bean can for a teapot, and I cooked over small thumbwood fires, either in established fire rings or drowned and buried in the sandy soil and dusted over with pine needles when I left each site. That was quite deliberate; I had been experimenting with stoveless travel back east, and left my old liquid fuel stove in Yosemite to save weight and continue the experiment. I wore gym shorts and a t-shirt during the days, and woolen knickers, a heavy wool sweater, a wool hat, and sometimes an anorak to keep warm at night. Luxury items included my camera, binoculars, bird guide, and something to read. Along with food, all of this somehow fit in or on my beloved little North Face Wrapac, with just 2500 cubic inches (40 liters) of interior space. I strapped the big sleeping bag on the top and the blue pad on the side. Midway through the trip the cotton canvas back panel of the pack ripped so I hand-sewed in a new panel made out of one of my old nylon gaiters. I didn’t need them anyway – it was a low snow year and I quickly learned to camp high so I could hit the remaining snow on the north sides of the passes while it was still firm. I would often cook my evening meal down in the trees and then hike on until sunset and sometimes on into twilight and moonlight to bivy above the mosquitoes and bears. Looking back I can see I might have gotten into serious trouble if the weather soured, but it never rained or snowed, and the one night I slept under the tarp was to try to conserve heat at a high bivy. So I got away with it. I didn’t stick to the JMT the whole way. I detoured over Cloud’s Rest and out to Red’s Meadow and Mono Hot Springs, adding extra mileage and elevation. My last resupply was at the latter on June 16th, and that somehow held me for the last eight days. I didn’t have any sunscreen for the first week or so, and burned my nose and lips so badly that I took to using spit to glue bits of toilet paper to them to give them a chance to heal. 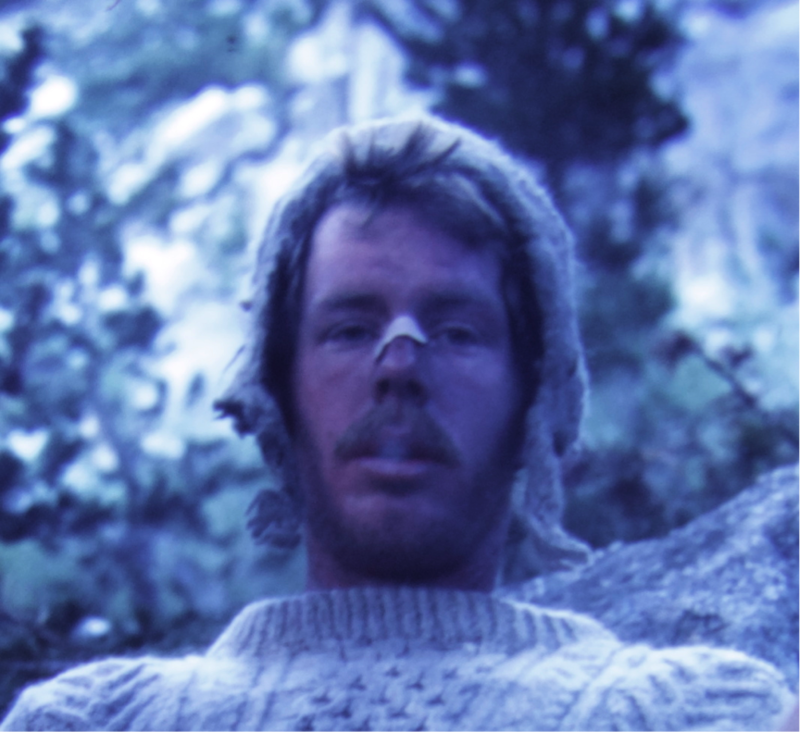 Most of my pictures from the trip are scenics, and there aren’t too many of those because I couldn’t afford more film, but I have a selfie that I took using my camera’s timer one evening by a campfire, looking lean and dirty in my wool sweater and hat, with a ridiculous white patch on my nose (all my photos are slides and I have no good way to scan them now, so here’s a digital photo of the slide). Big Red in full dirtbag mode. My journal is terse, the whole journey recorded in just 28 scrawled pages in a small spiral-bound notebook. The last four days are recorded in a single, long entry, written from memory while nursing a big can of Foster’s lager in Lone Pine, because I had somehow lost my only pen on the way to Muir Pass. There are few attempts to describe the scenery, and after more than 30 years of mostly being stored away my slides no longer evoke much in the way of specific memories. But I remember: Cold- blue alpine lakes, sparkling in endless sunshine, ringed by clean granite peaks and surrounded by scattered pines growing in cracks and pockets of sandy soil. Emerald meadows, rich and moist against the sere backdrop of baked and crushed granite and tortured trees, just coming into bloom with bright pink shooting-star flowers, Indian paintbrush, columbine, and lupines. A long-burning sunset watched wearily from outside the stone beehive-hut on Muir Pass. The faint, haunting, pineapple-vanilla smell of Jeffrey pines, dry-roasted out of them by the long hot days. Miles of dusty trail, dirty summer snow, and fractured rock high up in the alpine basins, approaching the southern passes. The Doppler drone of a hummingbird, darting past me to feed on penstemon and other flowers growing in a trailside hanging garden fed by seeping groundwater. Glimpses of the Sierra, compressed by the years into a jumpy film reel of memory, waiting to be rediscovered. Though I traveled solo during the day and usually camped alone, my journal has some notes about people I met along the way. Mark, a neophyte I met at Red’s Meadow and hiked with for a day, showing him the ropes. Pete, who I met partway through a 20 mile day up Evolution Valley ending with some serious postholing in thigh deep wet snow to make Muir Pass by sunset. Both of those guys shared some food with me, and I remember meeting a northbound couple that gave me some spaghetti, sauce mix, and a bit of dried ground beef. These gifts allowed me to stretch my meager supply further -- “Mount Whitney is starting to look like a definite maybe.” (morning of June 19, at Muir Pass). 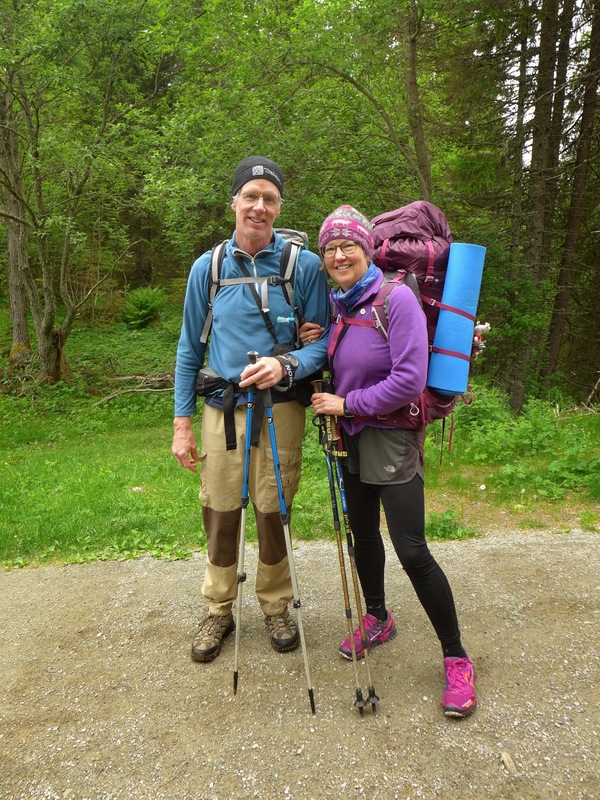 Almost every day I took a dive into a river or one of the alpine lakes, no matter how cold the water was, and rinsed out socks and underwear to keep the grunge under control. It was probably the cleanest long distance hike that I have ever done. With all the good weather I recall the Sierra as almost relentlessly friendly, but my journal makes clear that I had to contend with mosquitoes in the meadows during the days and evenings when I camped lower down. My binoculars were an old pair World War II vintage porro prisms, given to me by my stepfather. I sometimes slowed down enough to watch birds and wildlife. I noted hermit thrushes, Townshend’s solitaires, blue grouse, common nighthawks, and an eared grebe in an alpine lake below Muir Pass. There were coyote, marmots, deer, and of course bears. On my second night out, at Sunrise Camp, a bear came by and sniffed around quite close to me while I cowered in my bag. My food was safely hung from a tall pole put up for the purpose, but the sound of breaking branches later that same night announced a successful raid on some food bags hung from a tree. I had learned to do a counterbalance hang and that got me safely through the trip. The JMT wasn’t quite enough. When I got down to Lone Pine, I slept out in the desert, resupplied, washed some clothes at a Laundromat, and hitchhiked up to the east end of the High Sierra Trail for a six day crossing from the dry east wall of the Sierra to the giant sequoia groves on the west slope in Sequoia National Park. All the tourists and traffic around the big trees scared me back into the woods for one more night – on my way in I had noticed a fire-hollowed sequoia with a big opening in the side and a luxurious bed of dry needles, and backtracked to hole up there for one more night, steeling myself for the return to civilization. Thirty-three years later, I am in the last stages of planning and packing for our two-family, 24-day hike of the JMT. The rules have tightened, and the numbers of people vying for permits have increased exponentially – the first step of trying to secure a permit for our big group was a bit of a cliffhanger for us. I have spreadsheeted our meals, adding up calories and grams, trying to make sure we have enough but not too much. We have bought new backpacks and mattresses, a lightweight tent, and bear canisters, every item weighed and reconsidered, trying to keep the weight down but maintain some measure of comfort. 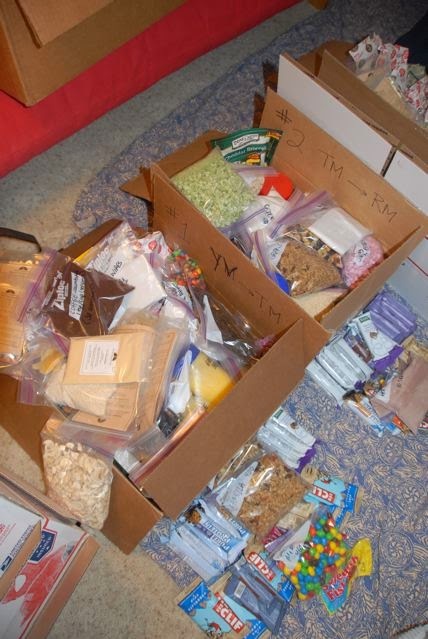 Our companion family in Vermont has put together and sent out resupply buckets and packages, with almost 100 pounds of food going to Muir Trail Ranch for the seven day stretch to Kearsarge Pass. This will be in many ways the antithesis of my spontaneous solo trip in 1981. But I am looking forward more than ever to hiking the trail with my family and friends, with good food and time enough to slow down, smell the flowers, and take the occasional side trip to a peak or hot springs. Despite all the planning, it will still be an adventure. Now I see where Molly gets her storytelling skills! Great story! Enjoy the JMT! Welcome, glad to here you're enjoying it! I love this story and the fact they are going back!